I just wanted to say thank you for the most Speediest Service! My online order placed on Saturday was delivered a few minutes ago... I now have the item installed and working - and thats great! Thanks again - I will certainly come back to shop with you folks again. Are your speakers looking a little dull? Try dressing them up with the Amped Classic Single Speaker Wall Plate, it's the bling bling your speaker system is screaming for. Well, if they could scream it's very possible this is what they would be after. 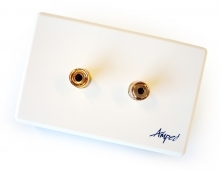 The Amped Classic Single Speaker Wall Plate is perfect for use in conjunction with the Amped Classic 5.1 Surround Sound Speaker (White Wall Plate). Your home or office will be looking mighty snazzy with this classically stylish wall plate aiding to hide that rat's nest of wires neatly within your wall cavity. The Premium Classic Amped AV Cover Plate has been specifically designed to suit the existing décor of Australian homes and feature a unique snap on faceplate for easy installation. The corrosion resistant 24k gold plated binding post terminals are suitable for speaker cable up to 10 AWG and provide the optimal environment for pure signal transmission. Better still, the Amped Classic Single Speaker (White Wall Plate) is compatible with a range of Dolby formats including Dolby DTS™, Dolby True HD™ and DTD HD Master Audio™. Your speakers will be singing in all kinds of harmony! I was very happy with your service. Couldn't fault it and will use your website again & recommend it to others.